Acme Pool Construction, Inc. was established in 1993 as a family owned business by Peter Folkringa, Jr. and his wife Kim. Peter started in the pool industry as a teenager, originally working with his dad, who started Acme Pool Company in 1963. Acme Pool Construction has been creating new pools and recreating existing pools for many decades. With over 40 years of experience in building, remodeling and servicing pools, Peter Folkringa, Jr., and his admirable team are excited to create and build your custom pool designed uniquely just for you! We have a team of great guys that take pride in their work and you would be pleased to work with. At Acme Pool Construction, we care about our customers! We have built our reputation on good old fashion values and customer service. We believe in providing high quality product, keeping our word and operating our business with utmost integrity. Our goal is to build every pool to the peak standards of quality with the top of the line equipment. To add to that is our trustworthy and long-time employees who take pride in the pools they build and remodel. We strive to live up to our name, ACME, to achieve the highest point! We are pleased to say that our growth and success are driven by great employees and loyal customers who trust in us and refer us to their friends and family. 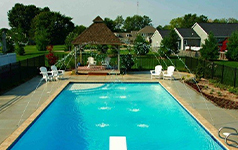 We at Acme Pool Construction of Grand Rapids, Michigan, understand the importance of choosing a reliable pool builder with the experience and integrity that you can trust. We know that your schedule is important, just as ours, and we strive to adhere to our schedule. (we won’t promise you a time frame that we don’t believe we can keep.) We care about our customers every step of the way and work closely with you as we build from start to finish. Acme Pool Construction, Inc. is a proud member of the Aquatech Society; an elite group of builders from across the nation, who by invitation can attain membership. Members history must demonstrate their integrity, reliability and quality of their business ethics and proven their building talents in the industry, to attain membership. Aquatech Members can achieve superior knowledge in the industry by sharing in the membership network of experts, attending education seminars, and learning the latest technology, which allows us to fulfill our commitment to customer satisfaction. Today United Aqua Group is widely recognized as the most prestigious and comprehensive professional member organization in the pool building and retail industry. Battle Creek, Bay City, Benton Harbor, Big Rapids, Cadillac, Copper Harbor, Charlevoix, Cheboygan, Empire, East Grand Rapids, Glen Arbor, Grand Haven, Grand Rapids, Holland, Ionia, Jackson, Kalamazoo, Kentwood, Ludington, Mackinaw City, Manistee, Mount Pleasant, Muskegon, Niles, Norton Shores, Owosso, Pentwater, Petoskey, Saginaw, Sault Sainte Marie, Saugatuck, South Haven, St. Ignace, Suttons Bay, St. Joseph, Silver Lake, Traverse City, Walker, Warren, Wyoming.